Promoting youth entrepreneurship in Hawai’i, STEMD² proudly supports the Lemonade Alley challenge. STEMD² will sponsor math teachers who mentor students throughout the process. Nonprofit organizations, schools, and companies are invited to enter teams of K-12 students in the seventh annual Lemonade Alley challenge, scheduled for Saturday, April 8, at Pearlridge Center in Aiea. 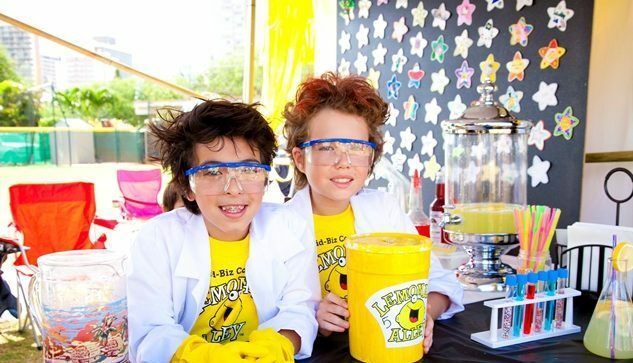 At Lemonade Alley, teams invent a lemonade recipe, build a stand, and raise money for the charity of their choice. Teams from nonprofit groups are encouraged to raise money for their own programs. Lemonade Alley is a great way to share an organization’s story, connect with the community, and build internal morale. Organizations and companies are also encouraged to participate as event sponsors or prize donors. Prizes can be themed to reflect an organization’s or company’s message. Participation is easier than ever. Starting this year, Lemonade Alley is providing all infrastructure including tents, tables, chairs, wash stations, and safety equipment. Each team is assigned one six-foot table to make their lemonade stand business. Teams should provide their own recipe ingredients, signage, and stand decorations. Optional Saturday workshops are offered March 11, 18 and 25. Topics include: recipe inventing, lemonade stand building and sales pitching. Professional chefs, designers and marketing experts, along with student ambassadors from previous Lemonade Alley challenges will provide presentations and mentorship. Space is limited and slots are going fast. Register your team today by visiting www.lemonadealley.com. Entry fee is $25/team. Contact Ronalyn Reyes at (808) 699-1807 or help@lemonadealley.com for more information. Lemonade Alley for Schools from Hawaii DOE - Video Technology on Vimeo.